Will Motorola continue the Moto Z line into 2019 and keep Moto Mods alive? 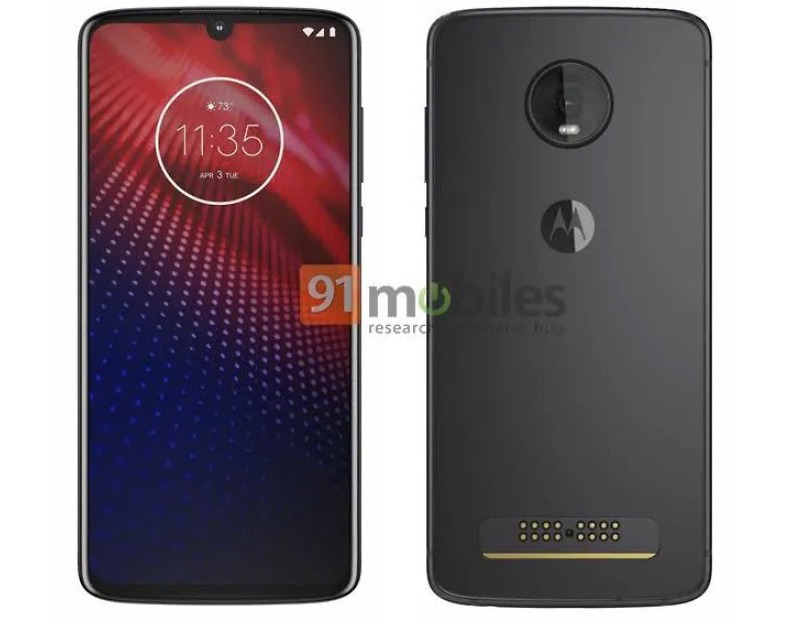 It looks that way, assuming these here press renders of the Moto Z4 are the real deal. The images were posted by 91 Mobiles and they do look convincing enough. Well, they look like previous Moto Z phones, which would make sense if Motorola wants to continue using Moto Mods from previous years. I’m not sure there is a ton to point out here other than the half-circle notch you see at the top of the phone. Last year’s Moto Z3 (our review) did not adopt the notch trend, even as others from Motorola did, so this is new to the Z line. Other than that, we’ve got pins on the back for Moto Mod connections, what appears to be a camera puck like other Z phones have had, possible headphone jack on the bottom, potential for an in-display fingerprint reader (there isn’t one showing, so we’re assuming), and a full-screen experience up front. The camera is looking like a solo shooter, though, which would be odd for a Motorola phone these days. Apparently, there is a rumor that Moto may include a single 48MP camera. Other supposed rumors suggest a Snapdragon 855 in this phone, as well as 5G support via Moto Mod. The 855 would be welcomed since last year’s Moto Z3 skipped the newest Qualcomm silicon for a year-old chip. As for the 5G Moto Mod, I’m going to go ahead and guess that the 5G Moto Mod Motorola is about to sell will just work with this phone. Any interest in the Moto Z line still? Poll: Do You Own a Google, Samsung, or OnePlus Phone?